VANCOUVER, BC--(Marketwired - July 05, 2017) - Sarama Resources Ltd. ("Sarama" or the "Company") (TSX VENTURE: SWA) is pleased to report that the first phase of exploration on the Company's recently-acquired1 Botoro Property ("Botoro" or the "Property") in south-west Burkina Faso has identified several gold-bearing quartz vein systems associated with regional shear zones and a preliminary soil geochemistry survey has returned gold-in-soil anomalism associated with structural features over a distance of approximately 10km. Of principal interest are three zones of gold-in-soil anomalism, each extending over a distance of 2-3km and defined by +8ppb Au and +20ppb Au contours (90th and 98th population percentiles respectively), within a 10km-long corridor that is proximal to a north-trending regional-scale fault. Each of these three areas is proximal to cross-orientation trends of minor soil anomalism, potentially suggesting a favourable structural environment for gold deposition. Sarama's flagship properties are situated within the Company's South Houndé Project area in south-west Burkina Faso. 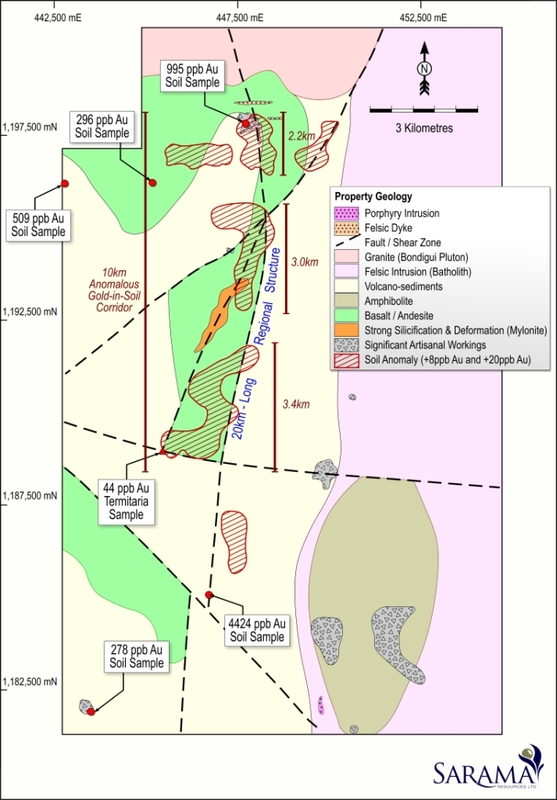 Located within the prolific Houndé Greenstone Belt, Sarama's exploration programs have built on significant early success to deliver an inferred mineral resource estimate of 2.1 Moz gold4. Acacia Mining plc is earning up to a 70% interest in the South Houndé Project by satisfying certain conditions, including funding earn-in expenditures of up to US$14 million, over a 4-year earn-in period and may acquire an additional 5% interest, for an aggregate 75% interest in the Project, upon declaration of a minimum mineral reserve of 1.6 million ounces of gold. Acacia has satisfied certain milestones and currently holds a 50% interest in the South Houndé Project and is continuing to sole fund exploration activities. Sarama holds a 31% participating interest in the Karankasso Project Joint Venture ("JV") which is situated adjacent to the Company's South Houndé Project in Burkina Faso and is a JV between Sarama and Savary Gold Corp. ("Savary"). Savary is the operator of the JV and in October 2015, declared a maiden inferred mineral resource estimate of 671,000 ounces of contained gold5 at the Karankasso Project JV. Sarama has also agreed to acquire1 a 100% interest in the Bondi Deposit from Orezone Gold Corporation (refer news release May 24, 2016). Bondi has a historical estimate of mineral resources of 0.3Moz Au (measured and indicated) and 0.1Moz Au (inferred)3.
i. The historical estimate of the Bondi Deposit reflects a mineral resource estimate compiled by Orezone Gold Corporation ("Orezone") which has an effective date of February 20, 2009. The historical estimate is contained in a technical report titled "Technical Report on the Mineral Resource of the Bondigui Gold Project", dated date of February 20, 2009 (the "Bondi Technical Report") and is available under the profile of Orezone on SEDAR at www.sedar.com. ii. Sarama believes that the historical estimate is relevant to investors' understanding of the property, as it reflects the most recent technical work undertaken in respect of the Bondi Deposit. iii. The historical estimate was informed by 886 drillholes, assayed for gold by cyanidation methods, were used to interpret mineralised envelopes and geological zones over the area of the historical estimate. Gold grade interpolation was undertaken using ID² methodology based on input parameters derived from geostatistical and geological analyses assessments. Field measurements and geological logging ofdrillholes were used to determine weathering boundaries and bulk densities for modelled blocks. 4. South Houndé Project - 43.0 Mt @ 1.5 g/t Au (reported above cut-off grades ranging 0.3-2.2 g/t Au, reflecting the mining methods and processing flowsheets assumed to assess the likelihood of the inferred mineral resources having reasonable prospects for eventual economic extraction). The effective date of the Company's inferred mineral resource estimate is February 4, 2016. For further information regarding the mineral resource estimate please refer to the technical report titled "NI 43-101 Independent Technical Report South Houndé Project Update, Bougouriba and Ioba Provinces, Burkina Faso", dated March 31, 2016. 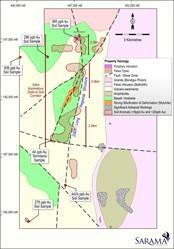 The technical report is available under Sarama Resources Ltd.'s profile on SEDAR at www.sedar.com. 5. 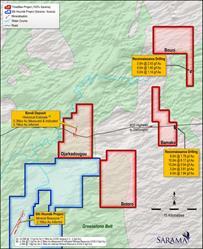 Karankasso Project - 9.2 Mt @ 2.3 g/t Au (at a 0.5 g/t Au cut-off). The effective date of the Karankasso Project JV mineral resource estimate is October 7, 2015. For further information regarding the mineral resource estimate please refer to the technical report titled "Technical Report and Resource Estimate on the Karankasso Project, Burkina Faso", dated October 7, 2015. The technical report is available under Savary Gold Corp's profile on SEDAR at www.sedar.com. Sarama has not independently verified Savary's mineral resource estimate and takes no responsibility for its accuracy. Savary is the operator of the Karankasso Project JV and Sarama is relying on their Qualified Persons' assurance of the validity of the mineral resource estimate. 6. For further information regarding the drilling on the Bamako and Bouni Properties, please refer to the technical report titled "NI 43-101 Independent Technical Report South Houndé Project Update, Bougouriba and Ioba Provinces, Burkina Faso", dated October 28, 2013. The technical report is available under Sarama Resources Ltd.'s profile on SEDAR at www.sedar.com. Information in this news release that is not a statement of historical fact constitutes forward-looking information. 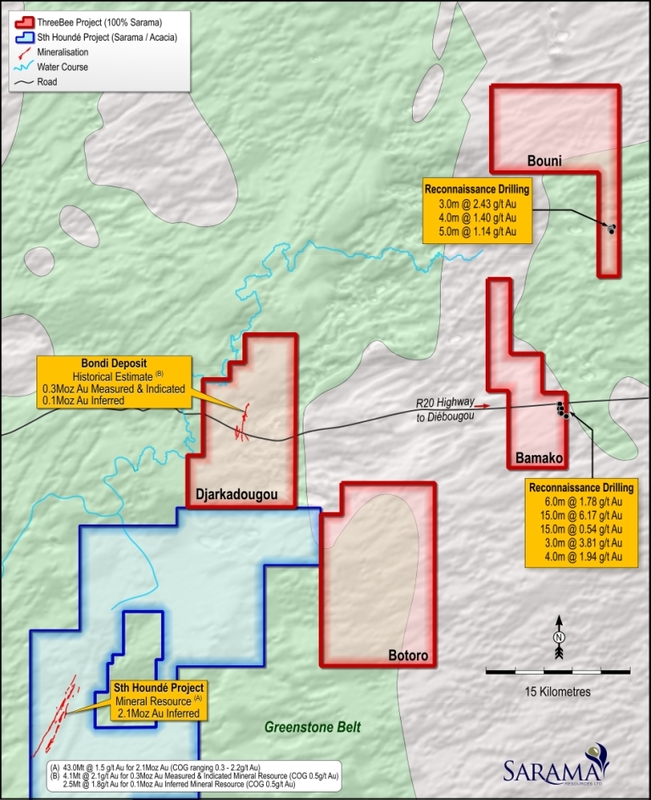 Such forward-looking information includes statements regarding the Company's plans for exploration at the ThreeBee Project and the potential for the Botoro Property to host gold mineralization of significance, drilling and geochemical and geophysical surveys at the South Houndé Project, the Earn-In Agreement with Acacia, including the amounts that may be spent on exploration and interests in the South Houndé Project that may be earned by Acacia upon making certain expenditures and estimating a minimum reserve, the potential to expand the present oxide component of the Company's existing estimated mineral resources, and future exploration plans. Actual results, performance or achievements of the Company may vary from the results suggested by such forward-looking statements due to known and unknown risks, uncertainties and other factors. Such factors include, among others, that the business of exploration for gold and other precious minerals involves a high degree of risk and is highly speculative in nature; Mineral Resources are not Mineral Reserves, they do not have demonstrated economic viability, and there is no certainty that they can be upgraded to Mineral Reserves through continued exploration; few properties that are explored are ultimately developed into producing mines; geological factors; the actual results of current and future exploration; changes in project parameters as plans continue to be evaluated, as well as those factors disclosed in the Company's publicly filed documents. There can be no assurance that any mineralisation that is discovered will be proven to be economic, or that future required regulatory licensing or approvals will be obtained. However, the Company believes that the assumptions and expectations reflected in the forward-looking information are reasonable. Assumptions have been made regarding, among other things, Acacia's continued funding of exploration activities, the Company's ability to carry on its exploration activities, the sufficiency of funding, the timely receipt of required approvals, the price of gold and other precious metals, that the Company will not be affected by adverse political events, the ability of the Company to operate in a safe, efficient and effective manner and the ability of the Company to obtain further financing as and when required and on reasonable terms. Readers should not place undue reliance on forward-looking information. The soil geochemistry survey at Botoro was conducted on 800m x 200m (E-W x N-S) grid over the greenstone portion of the Property, with hand-dug samples being taken in the appropriate level in the soil horizon. Termitaria sampling was conducted in conjunction with the soil geochemistry survey where termite mounds were present and warranted sampling. Termitatia sampling was conducted using sieved material from quarter cone sampling of each mound. Analytical work for the Botoro soil geochemistry and termitaria survey was undertaken by the SGS A.A. laboratory in Ouagadougou, Burkina Faso. Assays are determined by 'bulk leach extractable gold' method on approximately 2kg of sample material, with an atomic absorption spectroscopy ("AAS") finish. Lower and upper detection limits are 1ppb Au and 10,000ppb Au respectively. The reported assay values are as received for the specific samples and no grade cutting has been applied. Sarama undertakes geological sampling and assays in accordance with its quality assurance/quality control program which includes the use of reference materials prepared in-house for soil geochemistry surveys. A total of 842 samples were taken for the survey, with 65% returning Au values over the lower analytical detection limit. The survey returned minimum and maximum Au values of 2ppb Au and 4,424 ppb Au respectively with the mean and median Au values of the data set being 11ppb Au and 2ppb Au respectively. The 25th and 75th percentiles for the survey were 0.5ppb Au (equivalent to half detection limit) and 4ppb Au respectively with standard deviation being 158ppb Au. Gold anomalism trends were identified by visual examination of interpolated Au value maps produced using inverse distance weighting (squared) methodology over an equi-directional search distance of 800m and a cell size of 200m. Identified trends generally corresponded to the 90th and 98th percentiles of the Au value population (+8 ppb au and +20 ppb Au respectively). Identified trends were validated by assessment with sample logging and regolith data. For further information regarding the Company's general sampling and QAQC protocols please refer to the technical report titled "NI 43-101 Independent Technical Report, South Houndé Project Update, Bougouriba and Ioba Provinces, Burkina Faso", dated March 31, 2016. The technical report is available under the Company's profile on SEDAR at www.sedar.com. Scientific or technical information in this news release that relates to the Company's exploration activities in Burkina Faso is based on information compiled or approved by Guy Scherrer. Guy Scherrer is an employee of Sarama Resources Ltd and is a member in good standing of the Ordre des Géologues du Québec and has sufficient experience which is relevant to the commodity, style of mineralisation under consideration and activity which he is undertaking to qualify as a Qualified Person under National Instrument 43-101. Guy Scherrer consents to the inclusion in this report of the information, in the form and context in which it appears. Scientific or technical information in this news release that relates to the preparation of the South Houndé Project mineral resource estimate is based on information compiled or approved by Adrian Shepherd. Adrian Shepherd is an employee of Cube Consulting Pty Ltd and is considered to be independent of Sarama Resources Ltd. Adrian Shepherd is a Chartered Professional Member in good standing of the Australasian Institute of Mining and Metallurgy and has sufficient experience which is relevant to the commodity, style of mineralisation under consideration and activity which he is undertaking to qualify as a Qualified Person under National Instrument 43-101. Adrian Shepherd consents to the inclusion in this news release of the information, in the form and context in which it appears. Scientific or technical information in this news release, in respect of the Bondi Deposit relating to mineral resource and exploration information drawn from the Technical Report prepared for Orezone on that deposit has been approved by Guy Scherrer. Guy Scherrer is an employee of Sarama Resources Ltd and is a member in good standing of the Ordre des Géologues du Québec and has sufficient experience which is relevant to the commodity, style of mineralisation under consideration and activity which he is undertaking to qualify as a Qualified Person under National Instrument 43-101. Guy Scherrer consents to the inclusion in this report of the information, in the form and context in which it appears.